Skills to manage customer escalations need to be part of any successful manager’s toolkit. Google’s Dictionary defines escalation as “an increase in the intensity or seriousness of something; an intensification”. When customer expectations are not met or they feel that their views have not been heard, it is human nature to want to “intensify” and escalate to the next level. There is a general belief among many customers, that if they escalate to a senior leader, then action will happen faster. However, this is not always the case. Your first priority as a leader is to prevent un-needed escalations from occurring. If the experts closest to the work are empowered and stay involved, the issues will get resolved faster. When this is not possible, there are best practices to follow to ensure your escalations get the best results. Here are 10 tips to master customer escalation management and achieve the best outcomes for your customers, your employees and your business. Your first priority as a leader is to prevent un-needed escalations from occurring. You can do this by ensuring that the team members interacting directly with customers have the tools and training that they need to be successful. The staff must also be empowered to use their judgment and make the majority of day to day decisions on behalf of their customers. Last, responsibilities, accountabilities and measurements of success among this team must be clear and documented. If you observe a team that is spending most of its time in fire fighting mode, I believe that means we have a leadership problem. If you inherit a team like this, step back, observe and ask yourself if they have the tools, training, direction and judgment to be successful. Coach team members to take ownership of difficult customer situations and avoid passing them off to someone else. I have found that there is always “something” you can do to help a customer. This may include simply listening, offering your name and contact number, reaching out to someone else on their behalf, asking additional questions, sending them some related documentation or going out of your way to find the right answers to their questions or concerns. Customers may ask for things we can not offer. In these cases, it is best to be honest with the customer, but then focus on what you can do and offer a few options for them to choose from. When team members take ownership, the ownership should stay with them until the problem is resolved. Wait.. are there good escalations? Yes there are! implementation services, challenges will always occur at some point in a customer’s lifecycle. When these challenges occur, we have an opportunity to turn a challenge into a positive experience for both the employees and customers, by simply asking for help. This may mean asking a peer, a boss or even a subject matter expert in another department for help. Unfortunately, I have observed that employees tend to hesitate before asking for assistance. Instead, they will use the same practices or people to try to solve a problem. They also wait to escalate internally, until the problem has gotten significantly worse and we have little time to react. Encourage employees to ask for help early in the remediation process and before the problem becomes a full fledged crisis. If they escalate before an important date has passed or a Service Level Agreement (SLA) is missed, we still have a chance to meet the customers’ commitments. The better we work collectively and proactively to identify options and a resolution, we will eliminate the need for a customer to escalate higher within a company. The following communication tips could be applied to most business correspondence but are especially important when interacting with customers or asking for help internally. Email is a good tool for a “first” interaction, or for a written summary after the fact. However, email is not the right tool when working back and forth with a customer or group of coworkers to solve difficult problems. Email adds time to resolution: I would guess that wasting time with email chains, can at least double the time it takes to get to the next step in problem resolution. Instead, get the right parties together on the phone, face to face, or some combination of both to talk through the issues at hand. As a leader, if you start to get ccd on a back and forth email chain, step in and ask the team members to “take the conversation offline”. Email is impersonal: Email can tell a factual story, but is not a medium to empathize or sympathize. When you read email you can not hear the support or frustration, you can not see any facial impressions, and you can not hear a tone of voice. I have often seen email (and text messages) add fuel to a fire, due to their impersonal nature. When you are communicating internally or externally about a challenging customer issue it is important to include some level setting information, to adjust the level of detail to your audience and to clarify the purpose and next steps. Don’t assume that all of your audience members know the background or have heard about the issue before your update. Be sure to start with some level setting information. As a general rule, senior executive want to hear or read a summary of the issue, know the causes, and most importantly, what the next steps are and who owns the resolution. Conversely, a technical audience may want to get into the deep details of an issue including technical jargon, error messages etc. Make the communication purpose and asks clear. Regardless of who a communication is with and how it sent, the outcome needs to be clear. Is the purpose for awareness or to ask for help? If help, what actions are specifically needed and by when? State explicitly what you need, when you need it and the consequences if the specific action is not completed. When dealing with complex problems, it is sometimes necessary to see the issues first hand or to work with a customer in a more hand’s on, show them how manner. I have often heard the value of “breaking bread” with customers to strengthen a relationship and build trust, so working together to solve problems becomes easier. Before approving travel, be sure you understand the costs and benefits, and whether video conferencing or screen sharing may be a first alternative. However, there are some situations where the face time is definitely the best option. I was recently listening in to a customer escalation conference call and was quietly cringing and shaking my head “no”, while the call went on. The reason was, I was very concerned at how a few employees were responding to the customer’s questions. Instead of using words to instill calm, trust and credibility, they used “wishy washy” language that actually caused more doubt and escalated the customer’s feeling of pain. When dealing with a customer escalation, the words you use to interact with your customer contacts is critical to improve the likelihood of a successful outcome. About a year ago I discovered Jack Griffin’s book, “How to Say It: Creating Complete Customer Satisfaction” and have summarized a few verbiage tips from Griffin that directly apply to this topic. Sometimes it is better to say less than more. You may know that either you or a colleague dropped the ball on something. You may know that the product has a history of malfunctioning at certain times similar to what the customer has been experiencing. But, you do not need to tell the customer this. Instead, focus on what you can do to solve the customer’s problems and refocus his or her attention on the future with your company. Have you ever seen an escalation email that is sent to the entire world? The email may have included you, your boss, your boss’s boss, the head of technology, the janitor, the cook and even your mother. These types of communication often happen when employees do not know the proper method to escalate issues. Know The Path: Document clear escalation paths for the most common types of issues. For example, when issue A happens, then your first contact is to Manager, Fred Smith. If Fred is unavailable, contact Director, Sandra Harrington. If Sandra is not available, then contact Vice President, Wendy Rodriguez. Know The Medium: Determine the best method(s) to escalate within your business. For example, for certain types of issues, you may agree to start with an email communication. For more serious issues, you may determine that a conference call is what is more valuable. A skip level escalation occurs when a problem is not brought directly to a leader’s attention and is instead brought to his or her boss’s boss or even higher in an organization. What happens when you skip levels in a business environment? Usually nothing very productive. It leads to long email chains, urgent requests, drop everything meetings, bruised egos and stress. It may spur some action for the issue, but there are much better ways to approach this. Ideally, you should escalate by following a defined path, as mentioned in tip number 8. In lieu of a defined path, escalate to the team that is closest to the work and or the direct manager of that team, before escalating higher. One caveat to the skip level advice is regarding “head’s up “ emails. Sometimes it is wise to notify a senior leader when large issues are being addressed, to keep them in the loop and avoid future surprises. Be sure that they know you have everything under control and that the purpose of the communication is awareness only. When a customer escalation comes to me in my current, Executive Vice President role, my focus is on listening to the customer and really understanding what happened. While we talk, I take lots of notes, and there is always one thing in common at the end of our conversations. That is, I am usually not the person who can actually help the customer with their problem. Why? Because I am not close enough to their work and do not have the right level of subject matter expertise. Interestingly, there is often a trend when I follow-up with the team’s that are/ were doing the work for the customer. The team members involved know there are problems, they have been working really hard, sometimes 24/7 to solve the complications, they really care about the customer, but they have not yet been successful. Even with these challenges there is often a hesitation to escalate or ask for more help internally. This brings us back to tip number 2, support the good kind of escalations. 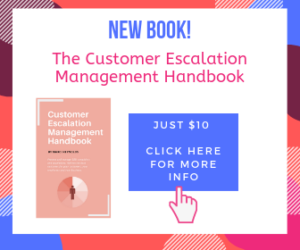 New: Customer Escalation Management Handbook! New for 2019: You may be interested in my new, Customer Escalation Management Handbook. Watch the video below, or click here for more info. I’ve found this post super useful, thank you! Thanks for the informative article. Prevention of unnecessary escalations still stands the top priority. How to handle a customer gone berserk and abusive on a technical call which he does not necessarily understands ? Isn’t that the tip number 3 ? This is great information. Very well written. Thanks for this one. Good job!